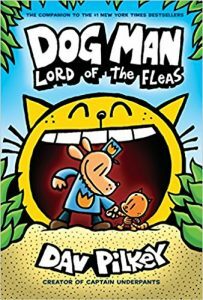 On Amazon right now you can get the new Dog Man: Lord of the Fleas: From the Creator of Captain Underpants (Dog Man #5) for just $7.05 – a 29% savings! This book is being released on August 28th, 2018. This will ship free with Amazon Prime or a $25 book order. This is part of Amazon’s Pre-Order Price Guarantee and if the price drops between now and the release date you will receive a refund of the difference.